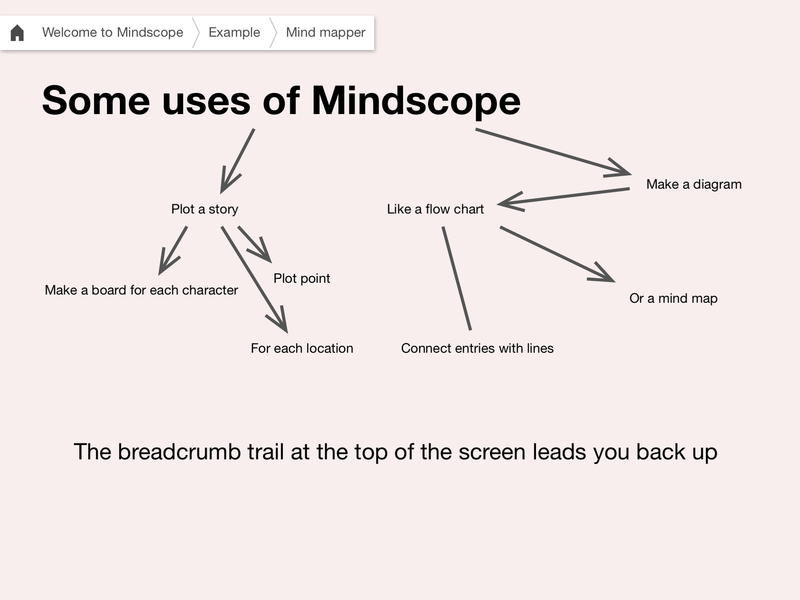 The other day I learned about a new app for iPad called Mindscope. It sounded intriguing so I installed the free version and quickly decided to spend the $2.99 to upgrade to the full version. Each workspace in Mindscope is called a board. You can adjust the color scheme to suit your tastes. 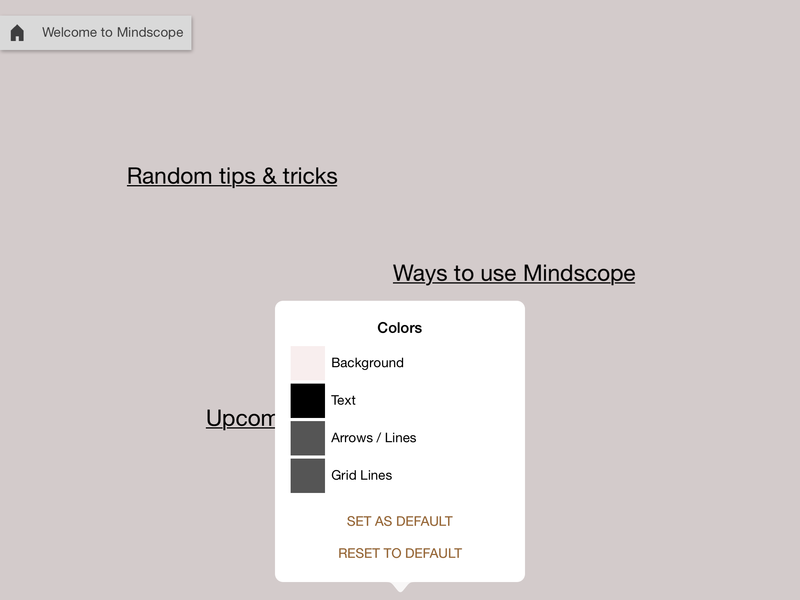 So you can build complex outlines with Mindscope. But there’s more. 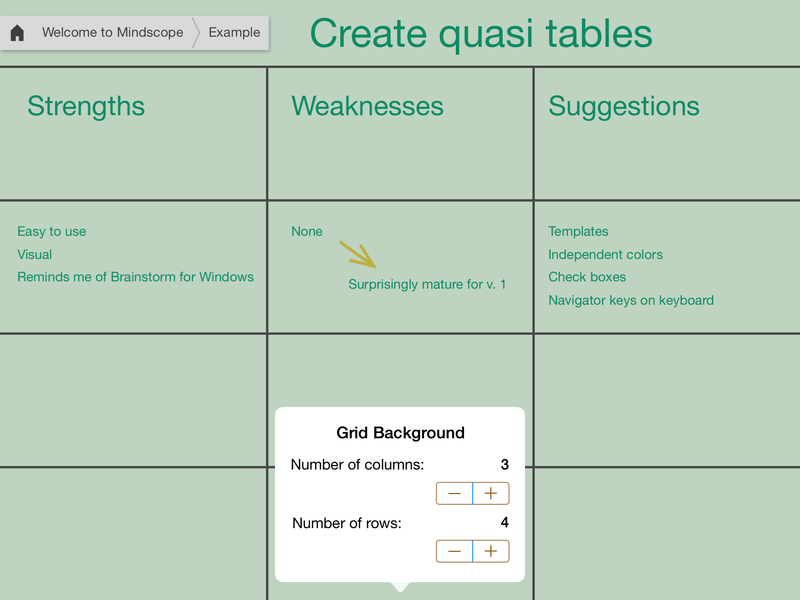 The developer has included the ability to build grids on screen, which you can use to visually organize the topics at any level. Add grid lines to your boards to organize your thoughts. Because you can add lines and direction connectors between entries, you can build simple diagrams. You have to manually create each link, so this isn’t the most efficient platform for doing complex diagramming, but it is certainly satisfactory for down and dirty diagrams. Create simple diagrams using Mindscope. What makes a Mindscope diagram more powerful than some other diagramming apps is how each entry in the diagram can be the rabbit hole to another level, which can be a diagram, a table or just a list. The export options are still a little rudimentary, but those that are available work well. 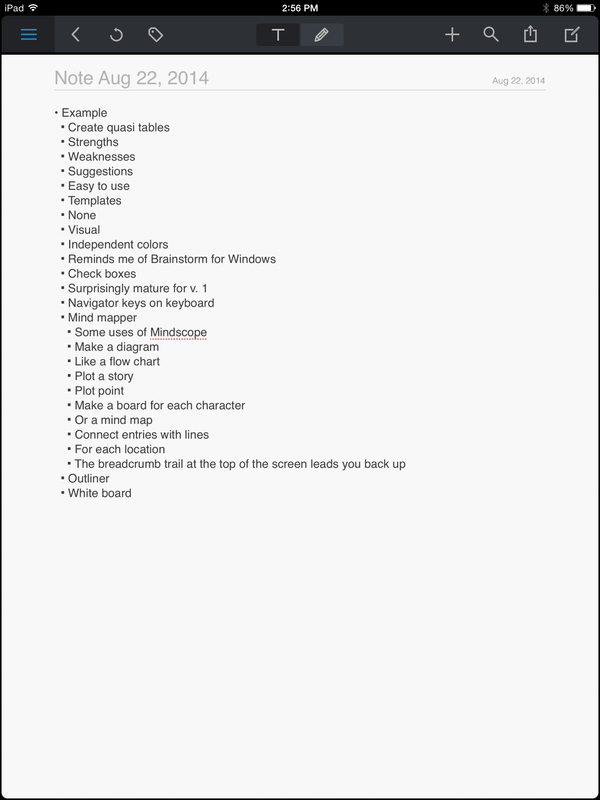 To me the most important is getting the text out in a usable outline, and that works just fine. The export function works from any board and includes only that board and any sub-boards. The output is a nicely indented outline. I used the copy command under the export menu in Mindscope to make a copy of the “Example” board above. Then pasted the result in NoteSuite. Add navigation keys to the keyboard to make it easier to edit an entry. Allow users to save boards as templates for quickly setting up subsequent boards. For instance, if you set up a SWOT table with your own layout, you might want to use that over and over again without the hassle of setting it up each time. I’m sure there are other improvements that will become apparent as I use Mindscope, but I have to say that for a version 1 app, it is remarkably mature. Kudos to the developer. I look forward to using Mindscope for a number of different purposes and projects. In the meantime, if you’re interested, check out the video on the developer’s website, as it does a much better job of demonstrating how the app works than I’ve been able with my simple screen grabs. Developer here. WOW, what a detailed and encouraging writeup – thanks so much for your thoughts! I love your ideas for future developments as well. So glad to hear you are finding the app useful! I am definitely finding Mindscope very useful. I’ve been building the elements for a novel in it… a novel I’ve been thinking about for some time, but only with Mindscope have I found a perfect resource for capturing ideas and building on the elements. (I could definitely do this in Tinderbox, but I would have to think things through a bit more than I have just to know where to begin in Tbx. But I expect the Mindscope will export into Tinderbox or Scrivener when the time comes to get serious about the actual writing.) Anyway, thanks for commenting, John.